Corbett Wild Iris Spa and Resorts in Corbett National Park, offers guests superb facilities and give them royal treatment that inspire them to return back to IRIS Resort again to enjoy the excellent hospitality and facilities for which the Resort is much famous. Also Surroundings locations of Corbett Wild Iris Spa and Resorts offers our client a proper touch of wildlife with tranquility & pure atmosphere for that most of people visit Corbett National Park. Specially for wild lifers who just searches for nature lap for them its pleasure because it located 8 Kms inside of jungle. One can perfectly plan a nice weekend outing as well as nature spotting @IRIS, with nearby attractions Corbett Falls, Safari, Adventure activity, Bonfire Nature walk with lots more. 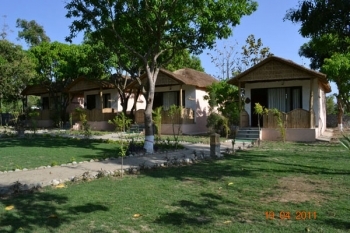 Iris Spa and Resort is located very close to the reserve forest of Corbett National Park makes it extra charming. It is situated 51 kms away from Nainital, on the Ramnagar - Nainital Road. 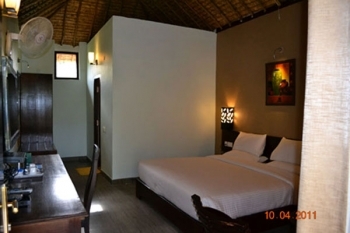 The Iris Corbett resort is having Luxury Thatched cottages with all the amenities like AC/Room heaters, LCD, Intercom, wifi internet access, Tea coffee maker etc. The resort is also having Luxury Swiss tents with all modern amenities. There is a multi cuisine restaurant in Corbett Wild Iris Spa and Resorts. AMID is the only restaurant in the region that has such a wide variety of cuisine to select from, Each dish is carefully researched and recreated bring to life the hearty exuberant flavors of the state. Royal tickling of the taste buds! - Welcome drinks on arrival. - Evening bon fire(in Winters), with Events. - Free use of Swimming Pool & In house Recreational activities like volleyball, soft ball cricket, f water polo, T.T., Carom, chess etc. - One Night Package will be 30% less of 2 Nights/ 3 days package. - The Packages are extendable on pro rata basis. - The Packages are commissionable to only bonafide Travel Agents. - Child below 5 years of age is on complimentary basis. - Child between 6 - 12 years of age will be 25% of the above package & above 12 years will be charged 35% of the package. - Extra Adult/Extra Child is net and Non-Commissionable. - Booking will be confirmed only after the receiving of 100% advance amount in our account. - Early check in and late checkout is always subject to availability of the rooms. - If cancelled before 21 days of check in date of the group, then no retention amount will be charged. - If cancelled within 14-20 days of check in date of the group, then 25% of the total amount will be charged. - If cancelled within 7-13 days of check in date of the group, then 50% of the total amount will be charged. - If cancelled within 6 days of check in date of the group, then 100% amount will be charged. - Incase No show / cancellation at the last moment, then also the above company will be liable to pay the entire amount of the total billing. By Road: The resort is accessible throughout the year from all major cities and town by road, all kinds of services available on the road. Train: Ramnagar is connected to other destinations like Delhi, Lucknow.